Recipe for success: combine two Michelin-starred Swedish chefs, Chef Marcus Jernmark (Restaurant Aquavit - New York City) and Chef Gustav Trägårtdh (Restaurant Sjömagasinet - Göteborg, Sweden), add Restaurant Aquavit as the venue, and let the chefs' creativity run wild to create a special Swedish Legends Tasting Dinner to inspire the senses as part of the North Nordic Food Festival. On October 3, 2013, we attended the Swedish Legends Tasting Dinner at Restaurant Aquavit in New York City featuring Michelin-starred Restaurant Aquavit’s Executive Chef Marcus Jernmark and Michelin-starred Restaurant Sjömagasinet’s Executive Chef Gustav Trägårtdh (Chef of the Year) of Göteborg, Sweden, as part of the first North Nordic Food Festival (October 2- 7, 2013) created by Honest Cooking and presented by Visit Sweden, West Sweden, and Visit Stockholm. 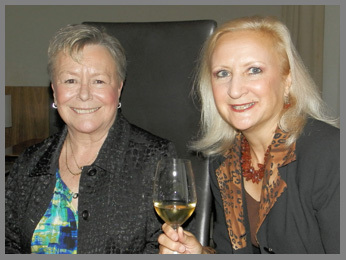 Annika Benjes, Director Public Relations, Visit Sweden, welcomed guests with, “Fasten your seat belts, the food trip is about to start,” and what a trip it was! Swedish cooking has literally exploded and has changed the way people think about food. In the talented hands of these inspired and inspiring chefs food took on newness and freshness, that enticed visually, first stimulating the senses with tempting aromas and presentations, and then delivering an explosion of flavor and taste sensations on the palate. 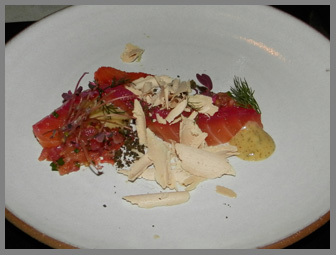 The setting for the Swedish Legends Tasting Dinner at Restaurant Aquavit complemented the gastronomic dining experience. The décor was a feast for the eyes with its cascading capiz shell chandeliers, recessed fairy lights, colorful paintings that graced the wall, tall black leather swivel chairs encircled our round stone table dressed with black leather placemats, a white candle set in a square glass holder, and a colorful and exotic flower set in a white freeform vase. Modern elegance, it was stunning in its simplicity with luxe added touches. 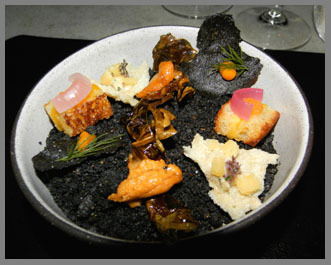 The dinner began with a bowl of tiny pre-amuses presented on a bowl of “hazelnut dirt” roe perched on a bit of sea urchin, egg yolk on a brioche, squid chips, seaweed crisps, and lighter than air, tapioca and mushrooms crisps artfully arranged in a bowl of polished stones to hold the crisps vertical. A selection of breads and rye crisps arrived with mounds of caramelized butter, coarse sea salt, and butter presented on a small piece of slate. 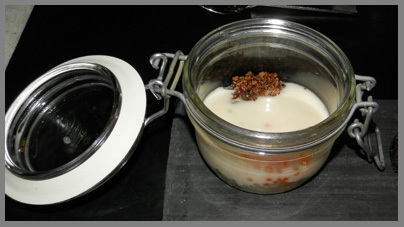 Next came the dream-like amuse bouche of black truffle and brown butter tapioca pearls, trout roe, and crispy Danish rye presented in a small closed spring-lidded mason jar, which Chef Marcus Jernmark asked guests to open so that he could ladle in warm celeriac soup. Opening the lids was magical, steam rising, aromas inviting, and then when tasted, it was amazing. 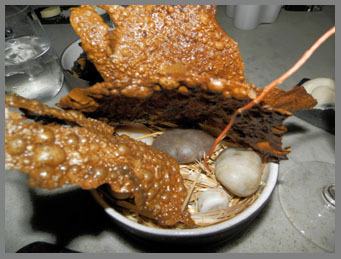 We loved the interplay of the rich flavors and textures, the creaminess of the soup, the texture of the tapioca pearls, the crunch of the crispy Danish rye, and the pop of the roe against our palates. Palates aroused, senses at attention, the first course on the menu was listed as Live Diver Scallop, Cucumber, Sea Urchin, Frosted Apple, and we were eager to experience it. When you combine two Michelin chefs you know that they will create a memorable evening, and the first course indeed set the bar for the tasting dinner. 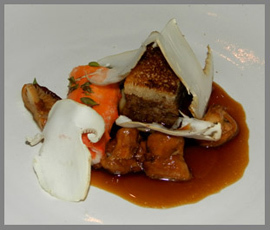 If “location” is the key word of real estate, then “presentation” is the key word of gastronomic dining. The Live Diver Scallop was gorgeously presented on a scallop shell that was set on a white linen napkin, which was set on a small white plate, resting on a bed of straw, set on a larger plate. 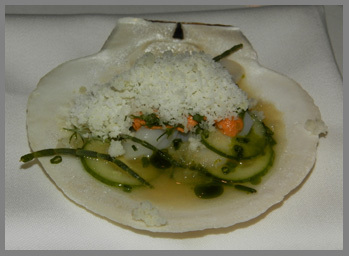 Thinly shaved raw scallops, miniature cucumbers, sliced sea urchin, and sea beans, were enhanced by frozen apple (the consistency was like a granite), which Chef Marcus Jernmark personally added to each guest’s shell. The production was wonderful, cold mist rising from the pan as Chef Marcus scooped the frozen apple onto the diver scallops. The taste was clean and fresh, and was well paired with Lackner-Tinnacher, Welschriesling, 2009, from Südsteiermark, Austria, which had mineral notes from the sandy clay, sand, and gravel terroir, to create a compatible sea meets earth marriage. 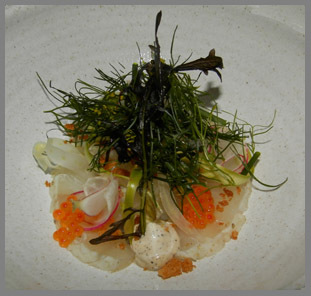 Next there was Fennel Salted Norwegian Halibut, Crudités and Brown Butter Mayo presented with cellophane thin sliced radish, shaved fennel, thinly shaved strips of raw asparagus, trout roe, crowned with dill and micro herbs and enhanced with a small dollop of the brown butter mayo. This was another well executed dish that captured attention with its presentation and then delivered on the palate with amazing taste sensations. Beet Cured Gravlax with “Forgotten Beet,” Blood Orange, and Shaved Foie Gras followed, which was gravlax dusted with leek powder, accented with blood orange, topped with a generous portion of foie gras, and complemented by mustard seed sauce, tiny red rose petals, and sea beans adding color as well as taste. The fourth course was Veal Sweetbreads, Charred Langoustine, Hazelnuts, Tarragon Emulsion, presented as langoustine tartar in a warm cream sauce artistically wrapped in a hibiscus leaf, the sweetbread topped with the tarragon emulsion, and chopped hazelnuts scattered on the plate recalling the spirit of autumn paired with Hedges Family Estate, Red Mountain 2011, from Washington State with 13.5% alcohol, a blend of Cabernet Sauvignon and Merlot. 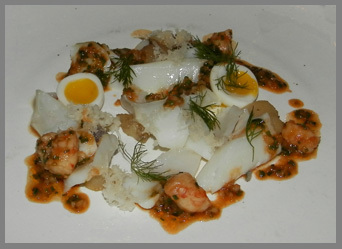 For the fifth course, there was Flaky Cod, Roasted Shrimp Vierge, “Gentlemen’s Delight,” Horseradish, and Sweet Shrimp, which was wild Norwegian cod presented with Gentlemen’s Delight (anchovies and potatoes), halved soft boiled quail eggs, and rock shrimp accented with tiny sprigs of dill. This was another attractive course artfully presented. Chef Gustav Trägårtdh personally added the rich sauce for the last savory course of Norwegian King Crab, Oxtail, Chanterelles, which was presented as a roulade of crab, a piece of oxtail sandwiched between two small toasts, and shaved raw chanterelles, in a rich sauce. For the cheese course, there was a selection of four cheeses from the Danish company, Arla Unika Cheeses, “unique range of cheeses drawing inspiration from Nordic seasons, land and nature, and developed in close collaboration with Michelin starred chefs.” Two of our favorites were the Danish blue aged for 40 weeks and oxygen starved, and a cheese made with pickling spices, dill weed, salt, and dill seeds, presented with fig and golden raisin marmalade and lingonberry preserves and miniature fruit bread. 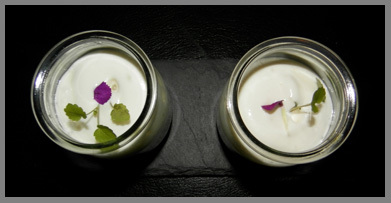 Continuing our gastronomic journey, there was a pre-dessert of warm spiced green apple cider topped with buttermilk foam garnished with a tiny red rose petal, and a micro herb garnish. That was the pre-dessert, and we could not wait to see what the chefs created for dessert! 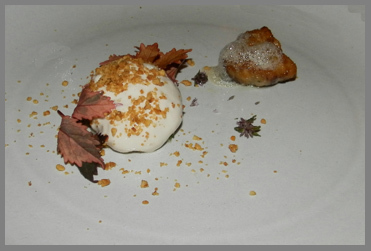 We were not disappointed; dessert, listed on the menu as Sea Buckthorn, Caramel Ice Cream, Almonds, was a studied dream of style and flavor in colors of orange and cream. 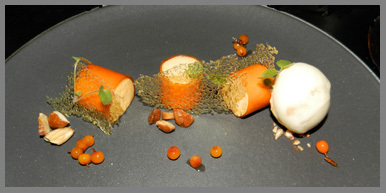 Sea buckthorn gelatin was wrapped around sea buckthorn cream, accented with spun sugar and micro herbs, with a scoop of caramel ice cream, and marcona almonds and sea buckthorn berries attractively scattered on the plate. 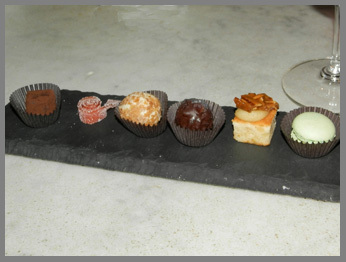 A selection of petit fours followed which included mint macarons, a nut-crowned cake, chocolate cake, fruit jellies, and chocolate truffles. 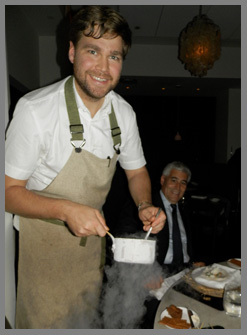 As a final farewell, guests received Aquavit’s Homemade Kladdkaka – chocolate cake presented in a cellophane bag tied with ribbon, and a souvenir menu to commemorate the Swedish Legends Tasting Dinner with the two famous chefs who hail from Göteborg, Sweden, Executive Chef Marcus Jernmark, and Executive Chef Gustav Trägårtdh. As this was the first of North Nordic Food Festival, we hope that it becomes an annual tradition. 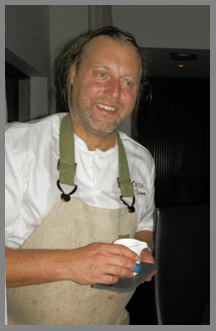 For information on Restaurant Aquavit, please visit their website: www.Aquavit.com. Restaurant Aquavit serves Lunch Monday through Friday from 11:45 am until 2:30 pm, and Dinner Monday through Saturday from 5:30 pm until 10:30 pm. The restaurant is closed on Sundays. Restaurant Sjömagasinet serves Lunch Monday through Friday from 11:30 am until 2:00 pm, Dinner Monday through Friday from 6:00 pm until 10:00 pm, and Sunday from 5:00 pm until 10:00 pm. The restaurant is closed on Sunday. © November 2013. Luxury Experience. www.LuxuryExperience.com. All rights reserved.